Wilson, NC Bojangles'® Tands, INC. Store #34 - Bojangles'® / Tands, Inc.
At the Bojangles’® in Wilson, NC, it’s all about the southern food our customers crave! Bojangles’® has all your favorites like crispy Cajun fried chicken, flaky biscuits made fresh, and flavorful fixin’s. 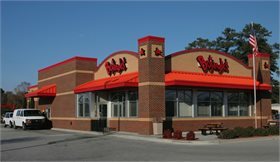 For breakfast, lunch and dinner, Wilson, NC loves the food at Bojangles’®. Located near the Wilson Industrial Air Center Airport, Bojangles’® is a popular choice for both air and ground travelers. Bojangles’® is proud to be a part of and serve the Wilson, NC community. We look forward to the wonderful Wilson Whirligig Festival each year as a time to have fun and celebrate with the Wilson, NC community!